Eating meat from four legged animals was prohibited in Japan for more than a thousand years prior to 1868. This ban was especially strict during the Edo Period (1603-1867). Buddhist influences were primarily responsible for this dietary restriction, but other cultural factors and the need to protect draught animals in times of famine may have reinforced the taboo. After the Meiji Restoration in 1868, the new leaders of Japan wanted, among other things, to reduce traditional social barriers and to encourage the adoption of beneficial Western habits. There may also have been a desire to weaken the power of the Buddhists. Lifting the ban on the eating of meat was a small step towards these objectives. Nevertheless, it must have astounded the nobility of the day to see the young Emperor Meiji eating beef. Despite the formal rescinding of the prohibition against the eating of meat in the late 1860’s, the consumption of meat remained extremely low for another century. Until very recent times meat (niku in Japanese) usually meant pork in eastern Japan (roughly from Tokyo to Hokkaido) and beef in western Japan (from Nagoya/Osaka to Kyushu). Historically, and even today, the people of the Kinki Region (Kyoto, Kobe, and Osaka) have been the heaviest beef eaters. For millennia the people of Japan lived on a diet of rice, vegetables, and seafood eaten with hashi (chopsticks). Although the meat taboo was removed over a hundred years earlier, by 1980 the average Japanese ate only 5.1 kg of beef (carcass weight basis). In some Western countries, where income levels are comparable with those in Japan, the average person commonly devours ten times this quantity each year. 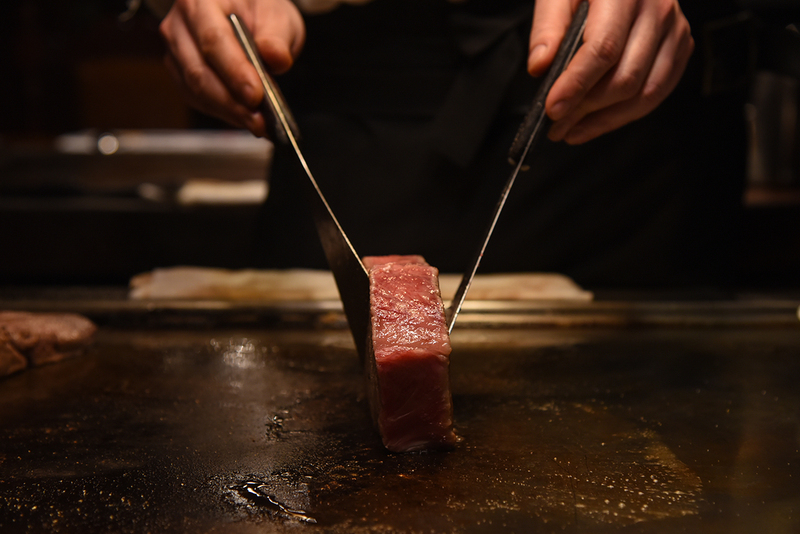 Although the younger generation has grown up with Western cuisine, knife and fork, most Japanese still enjoy beef best when it is prepared as very thin slices, cooked in the traditional manner and eaten with hashi. From about 1955 onwards, the mechanization of rice cultivation led to an increase in the availability of beef, as large numbers of draught cattle were fattened and slaughtered. At the same time the rapid economic growth, which started with the Korean War boom, was gaining momentum. People could afford the luxury of meat more often. The creation of genuine Kobe (or Matsuzaka or Omi) beef is a mystical folk art which may have been practiced as an underground cult before 1868. Some sources claim that certain daimyo and even some shoguns enjoyed especially fattened beef from Hihone hab (now Shiga Prefecture, the home of Omibeef). Most Japanese believe, however, that the art of producing Omi, Matusaka, or Kobe beef cannot be traced back to feudal times. These four breeds are now considered indigenous to Japan, but are not genuinely native cattle. There are two isolated populations of native cattle in existence. The Mishima wild cattle on Mishima Island (located in the Sea of Japan off Yamaguchi Prefecture) have never been crossed with modern European breeds. While they represent a genuine genetic curiosity, as of 1983 there were fewer than 40 head. The second, and more numerous, are a group of wild cattle on Kuchinoshima Island south-west of Kagoshima Prefecture. The progenitors of both the Mishima and Kuchinoshima cattle were probably brought to Japan by the ancestors of the modern Japanese people more than 2,000 years ago. Biochemical and genetic tests indicate that the native cattle are more closely related to the cattle of Northern Europe and Scandanavia than they are to the cattle indigenous to Taiwan, the Philippines, and other South East Asian Countries. The four modern Japanese breeds are the result of a substantial infusion of European blood during the Meiji Era, together with a government-sponsored selection programme initiated in 1919. For several decades prior to 1910, there was a great interest in importing European breeds to cross with native cattle. The basic aim was to improve the native strains for draught purposes, but better meat production was also a consideration. Exotic breeds were extremely popular and the price of pure-bred and cross-bred exotic animals often reached unreasonable levels, until the bubble burst in 1910. After this date, the importation of European breeds went out of fashion. After World War I, the Japanese Government decided to encourage the selection and registration of cattle exhibiting superior traits of both native and foreign types. There was a considerable gene pool to draw upon, as a wide range of European blood had been introduced to Japan. This variation, together with the original differences among the native cattle, permitted selection according to different criteria in various parts of the country. After World War II, the National Government moved to rationalize the registration process and formally recognized three major Wagyu types or breeds: Japanese Black, Japanese Brown, and Japanese Poll. The National Wagyu Cattle Registration Association was established in 1948. 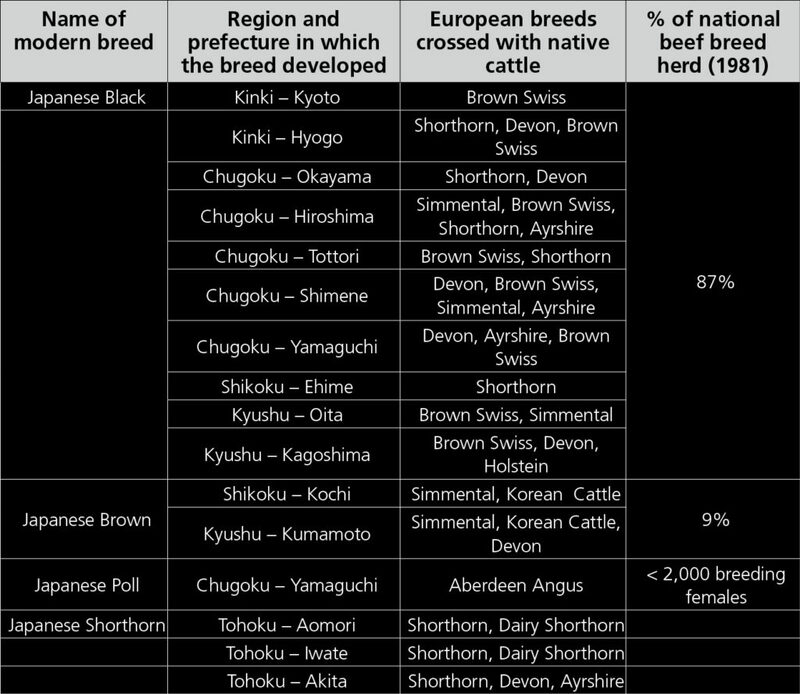 The Japanese Black breed included several fairly distinct types, and this is still the case today (e.g. Tottori, Tajima, and Hiroshima strains). The Japanese Shorthorn was not formally established until 1957. While it is hard to generalize, two traits of the Japanese Black often cited as disadvantageous are their narrow pin bones and their relatively poor milking capacity. The narrow pin bones create calving difficulties if the cows are crossed with bulls of the large-framed European breeds (such as Holstein or Charolais). The poor milking ability increases the costs of raising feeder calves since the calves often need artificial supplements. On the other hand, the Japanese Blacks (in particular the Tajima strain) are noted for their capacity to produce beef with a high degree of fat marbling (or sashi). It is this characteristic more than any other which accounts for the steady increase in the popularity of the Japanese Black breed. 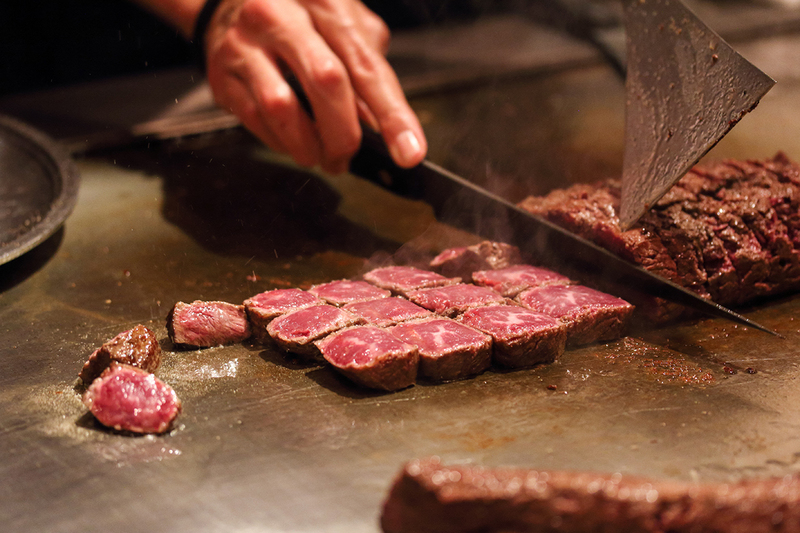 According to the website of the California BBQ Association, “In order to protect its domestic beef industry, the Japanese government imposed strict laws that prohibited the export of any living Japanese Wagyu cattle. However, in 1976, four Wagyu animals were imported into the U.S.: two Tottori Black Wagyu and two Kumamoto Red Wagyu bulls. Then in 1993, two male and three female Tajima cattle were imported, and 35 male and female cattle (consisting of both red and black Wagyu) were imported in 1994.